Friday October 9 1908 I was at home at work the rest of the day after going down to see Frank Woolf & wife start home. I have been rather out of sorts for some days with my throat and lungs. Will got me medicine so I did not need to go to the doctor. I go things pretty well righted up Will gathered corn in afternoon. Ida Colter came last night to attend the reception tomorrow and was there to the card party today which I did not attend. Saturday October 10 1908 I did baking and other work. Will gathered corn and I had dinner at 11.30 Will went to town at 12.12 and I at 1.12 with things needed down home. I helped to receive about 200 ladies this afternoon. I came home at 7.30 It was a most beautiful day and such a nice party. 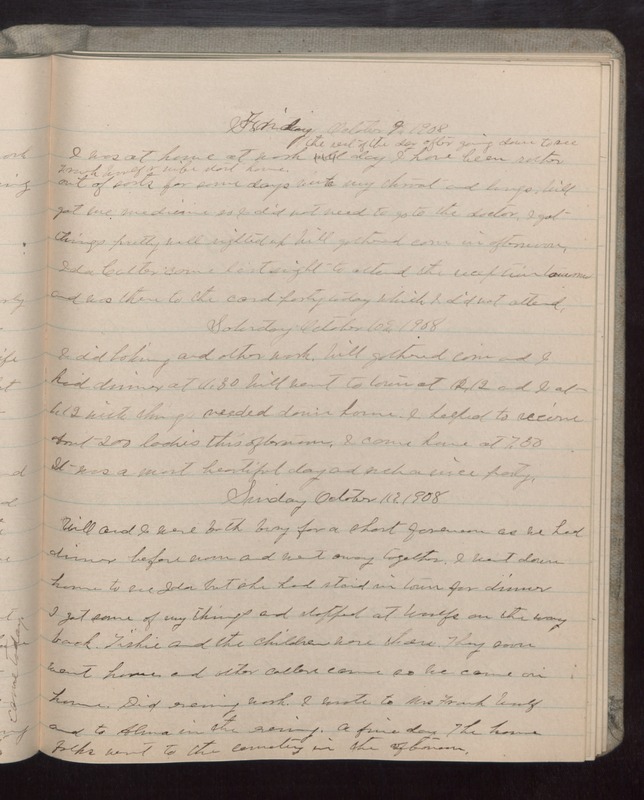 Sunday October 11 1908 Will and I were both busy for a short forenoon as we had dinner before noon and went away together. I went down home to see Ida but she had staid in town for dinner I got some of my things and stopped at Woolfs on the back. Tishie and the children were there. They soon went home and other callers came so we came on home. Did evening work. I wrote to Mrs Frank Woolf and to Alma in the evening. A fine day. The home folks went to the cemetery in the afternoon.